You will read everywhere on Internet that affiliate marketing is something where you can make truck loads of money and though it is true to certain extent, it is not as easy as you read them and I have been getting lot of emails and comments about my Clickbank Check that they have tried almost all auto pilot software on Clickbank but it just does not work for them and wants me to be suggesting them something where they can just create a cash machine online and pluck the money whenever they want and whatever amount they want but this is not the reality of affiliate marketing. Let us consider strengths of affiliate marketing and see why so many webmasters try and prefer affiliate marketing online. The biggest strength of affiliate marketing is – the very pure form of marketing. By pure form of marketing I mean the marketer is not involved in developing the product or providing the after sales support for the product or does not need to be doing lot of customer management hassles and can focus purely on generating sales. According to me it is one the prime reason that newbie webmasters gets attracted towards it. As the expense related to development, support and after sales management is out of the picture, the affiliates can have really fat profit margins. To add to the profit margins, affiliates can offer multiple products to the same customer. If we take an example of web hosting affiliate marketing, you will see that there are lot of web hosting review sites and one of the prime reason being that many host offer as high as 150% as affiliate commission for driving customers to them. So instead of setting up a web hosting business and managing the sales and services to customers, affiliate marketing to sale the hosting of some of the well-known hosts is always preferred. Let us consider weaknesses of affiliate marketing and understand that it is not all-glittering gold. As the affiliate is not promoting his own product, there is very little he can control. The quality of product, sales and after sale services is the responsibility of the product owner to serve the customer properly. If you are an affiliate and if you are referring your readers or existing customers to other products, you should make sure that the other product owner treats your customers well enough or else your readers or customer can think that you are not referring quality products but just for the sake of making quick bucks. Website not only need decent traffic to make decent income from affiliate marketing but it also needs to have the right kind of users who are ready to take an action or make a purchase. If you don’t have the right kind of users visiting your site(s), you may not be making lot of sales to make anything significant from affiliate marketing. When it comes to making money from ads on website, you can start accumulating tiny amounts in ads almost instantly but for making money with affiliate marketing it can take a long time to make that first sale. Many affiliates are driven into affiliate marketing only for money without adequate knowledge. They want to become overnight millionaires which means they try to trick their users into buying things under them without even knowing if the product is genuine or not. Let us look into endless opportunities that affiliate marketing offers if done the right way. There are millions of products that an affiliate can promote. Just to cite couple of examples – Amazon has hundreds of thousands of books and other related products to be promoted; Clickbank has tons and tons of digital products online in every possible niche that you can imagine can be promoted by affiliates. Exponential growth of Internet and eCommerce is making affiliate marketing even more lively. I am sure I don’t need to cite stats and numbers to prove the growth of Internet usage and online eCommerce for sure. There are affiliate offers where you get paid as long as customer keeps paying for the product he or she purchased and this opens up the concept of real passive income online. I am not a fan of believing in passive income and you can see why here but still recurring commission for making a sale once can be considered as real passive income. 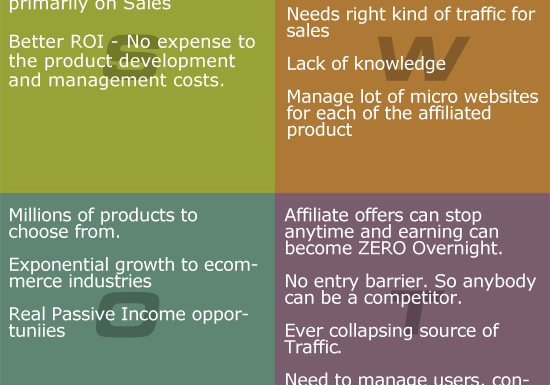 Last but the most important section of SWOT analysis is threats, which I think every affiliate should be aware of. So lets look at the threats in affiliate marketing. The biggest threat to affiliate marketing is you can be making thousands per month and one email and it can become a big zero the next morning. But similar thing happen to my RackSpace Cloud Hosting Account and iContact referral account in the past. I was making decent recurring commission every month for customers referred to them and one day got an email that they are moving to new and improved system and is discontinuing the current referral system. I was told that I will get last payment on some date and then I need to refer new customers to the new system and old recurring commission for existing customers will discontinue. According to me the next biggest threat to affiliate marketing is there is no entry barrier and so anyone can be competing with you. Product owner only pay for verified sales and so they don’t mind having anybody and everybody as their affiliate who follow their terms of services and so it makes fierce competition among the affiliates. Last but by no means the least threat to affiliate marketing is the source of traffic to affiliate sites and affiliate offers. Google Organic search has a clear focus of removing affiliate sites to a great extent but pay per click marketing is also moving away from affiliates. Earlier Pay Per Click Marketing in Google Adwords and Facebook Ads did allow affiliate links but it has all changed and is changing thick and fast to not allow affiliate marketing. Want to include the above graphics on your site or blog, Use the following code. Share your views about affiliate marketing in comments below.